This story dates back to the evening of May 10, 2003 where 12 girls and guys who initially began their friendship over the internet agreed to meet up again for a short reunion. The venue was set to be at Conggo Grille in Tomas Morato. The head of the group or rather, in internet-speak, the chat room head decided to bring along two of his friends to keep him company. One was his friend from college and another was his high school best friend (HSBF). Over pork sisig and beef kare-kare, everyone was so engrossed in their own small conversations updating one another about college life, high school stories and what have you. Fast forward to February 4, 2010. I guess you can call it fate that we see the same girl and HSBF dining once again at Conggo Grille, Tomas Morato. However, they only made reservations for a table for two and not twelve. 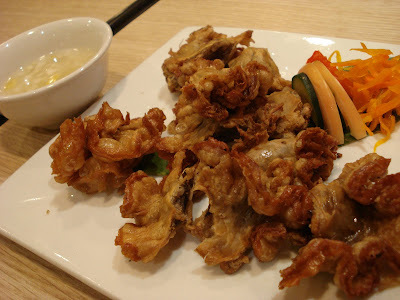 For starters, the girl requested to order a plate of Chicharon Bulaklak (Php. 180). This is a fun appetizer as it's delicious and perfect to munch on to start the conversation rolling. Just a word of caution though, do take this in moderation as it may not do very well for your heart. Up next was the Cream of Seafood Soup (Php. 245). Who would have thought that both the girl and HSBF are big soup fans and this dish was one of their Conggo Grille favorites. The serving is big and it is actually good for 4 pax. 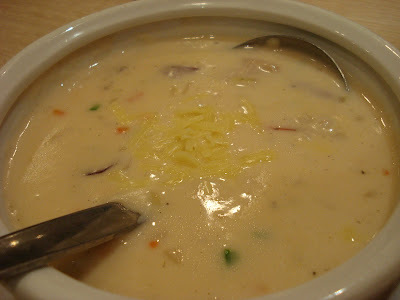 The soup is loaded with fish fillet, prawns, mussels and squid. What a perfect way to warm your stomach before the arrival of the main dishes. HSBF is a true-blooded Campampangan and no meal for him is complete without a sizzling plate of sisig! 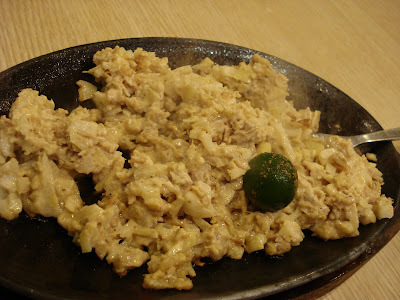 Instead of going for the original pork sisig, they opted to try the Chicken Sisig (Php. 180) instead. Both liked Conggo Grille's version however agreed that the mayonnaise/cream can be a bit overwhelming. 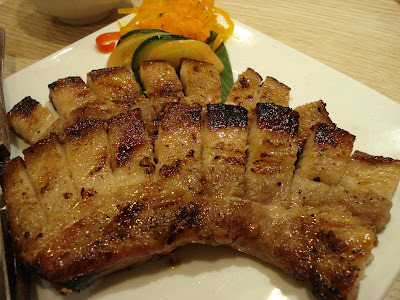 Last was the Inihaw na Liempo (Php. 140). This is perfect with a cold bottle of beer but since they just wanted to talk and bond that evening, they just chose to have the liempo together with a cup of garlic rice (Php. 35) and a glass of Coke. The serving size of the liempo was good for 2 to 3 pax but both also noticed that the lean meat was pretty small compared to the fatty portion. This is definitely one thing health buff's might shy away from. Over dinner, the two updated each other about their day and made plans about their future. Yes, you read it right. After severe determination, HSBF finally had the courage to contact animated talking girl and won her heart in the process. It has been seven happy years since that fateful evening at Conggo Grille and while a lot of things have changed, two things remain constant, the fact they they love each other's company and their fondness for Conggo Grille's food. Conggo Grille has branches in Tomas Morato (3322193), Araneta Center in Cubao (7092472), El Pueblo in Ortigas (6383857), SM City Pampanga (045-9639740) and many more! Love, love you both dearly!! Oyyyy, love story mo ba ito??? =P Sweeeet. Pagkain din pala ang start ng journey niyo to forever. Yum! OMG! The liempo looks so tempting!